As parents it's pretty important for us to give our children the ability to experience the same experiences that we did at a young age. For my kids this means being subjected to the likes of the Gummy Bears, Transformers, Bucky O'Hare and of course 80's video games. I have created 3 of these units, one for each child and all mimic a slightly different style and are scaled to the age of each kid. The units are constructed of 3/4" MDF in the exact same style as their full size brothers. 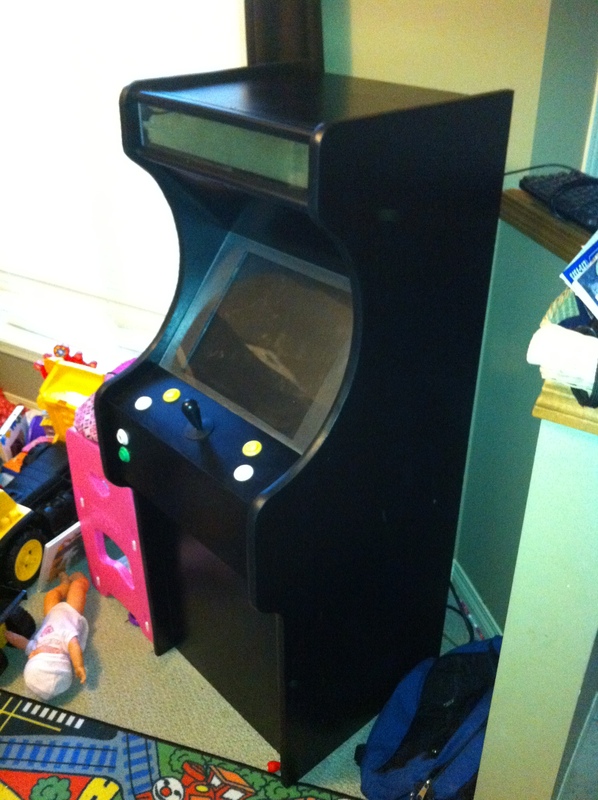 I created the side profiles by tracing a series of buckets in the garage directly onto the MDF and then cut out both the left and right hand sideThe joysticks and buttons are official arcade pieces purchaced from Happ and are connected to the internal PC via IPAC from Ultimarc. The c omputer consists of an ATX board mounted directly to the inside of the cabinet with standoffs and a 1TB hard drive that fits into a wooden shelf inside. All of this computer hardware was pulled from junk PC's from a variety of sources. The arcade look was finished off with some T-Molding from T-Molding.com. The monitors used are disassembled (free) 4x3 17" LCD's that have been mounted to a wooden bracket just behind the screen. Polished off with some piano finish thick black glossy paint and they look like the originals, just less then 1/2 the size. Mame is the emulator software and I have reduced the rom count down to just 3-4 games to keep things simple and easy to use.